An expression that held up in some quarters until around 1954 when some guy (Darrel Huff) wrote his landmark book, “How to Lie with Statistics” and pretty much decimated the whole concept. Simply put, if one used selected figures, and manipulated them just right, you could make any set of figures look pretty much like; --- just about anything anyone wanted them to look like. A fact that has not been lost on many, and most specifically on those who wish to keep our present day situation as is. And a fact that should not be lost on the reader, as their are many it seems who willingly, knowingly, with the intent to deceive, are going around doing just that. And thus a fact that the reader must always keep in the back of their mind. The following table shows average (2013) cotton yields (lbs./per acre) for that year. Take special note of the fact that Oklahoma is places right at the bottom of this table in terms of cotton yield per acre. And while to the uninitiated, the above table might appear as a simple set of statistics, all dealing with average cotton yields. To a skilled charlatan, well let’s just say, he could easily have a field day with it. Globally (including the third world) the average is somewhere around 600 lbs, and in America it’s somewhere around 800 lbs. per acre. SO WHY THE DIFFERENCE? Simple, the above calculation (17,502 / 17 = 1,030) assumed ALL states were growing an equal number of cotton acreage, which was not the case. While all mentioned states were growing cotton, some were only growing a few acres, while others were growing a lot. Thus the above equation, which assumes all are growing the same acreage, is not valid. Example 2: The above table ranks Oklahoma so low on the productivity scale that one is tempted to think that maybe our farmers should rethink growing it in the first place. HOWEVER, the table's data is good for that year (2013) and for that year only. A year which, here in Oklahoma, corresponded with major drought conditions throughout the state. And as Cotton is a thirsty crop, probably the main reason why crop yields were so low for that year. As the next table shows, yields went way up after the draught lifted up a bit, placing it somewhere towards the top of the list (where it stands today). 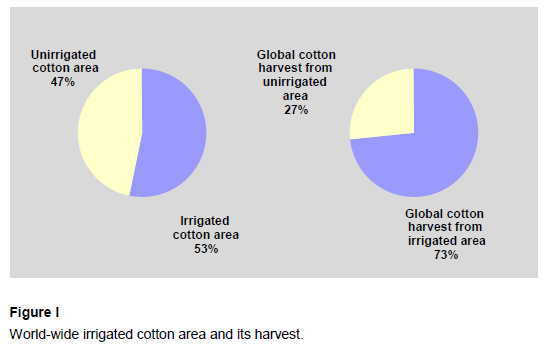 Example 3: Then note that the figures, of-and-by-themselves do not detail the exact type of cotton actually being grown. A factor that of-and-by-itself will affect exact yields per acre as some spices of cotton give large yields than others. Thus it is possible that the above table is comparing (figuratively speaking) apples to oranges etc. Okay, the only point being made here is that (if one has a mind to do so) statistics can OF-AND-BY THEMSELVES LIE. And when it comes to both Hemp and its closes competitor, Cotton, people seem hell bent on doing so. So with these let’s actually (using honest statistics and data), compare Industrial Hemp growth to its nearest competitor Cotton. NOTE: Our first calculation (above) was per crop planting, while the EU statistics refer to total yearly production. And as Oklahoma weather permits up to three major plantings per year, therefore the given figure of 1,300 pounds of hemp fiber should be increased by a multitude of three or 3,900 lbs. (per acre/yr). But whatever, it takes no genius to see that lands place under hemp production can easily out produce those placed under cotton production. Which according to the USDA only averaged 826lbs in 2014 and 755lbs in 2015. And note that these are American NOT WORLDWIDE averages. Also note that due to its much faster growth cycle, we can reasonably expect to grow two to three times as much hemp fiber crops as we can cotton growths on the same amount of land. Thus it is reasonable to expect that a hemp grower can produce a multiple of 300% to 800% more fiber per acre of land than today’s standard cotton farmer. Meaning a multiple of “times-three” to a “times-eight”, are possible and maybe more on a good year, but a multiple of “times-sixteen”, that is a bit hard to swallow. The average yield of cotton is 854 kg per hectare [761 lbs. per US acre] for irrigated cotton and 391 kg per hectare [348 lbs. per US acre] for rain-fed cotton. Giving us a total average of 650 lbs. per acre of global harvested cotton per acre. A Total average yield of 589 lbs. per acre of global planted cotton per acre. But noting that we had based our calculations on WW-2 era hemp farming statistics of only 2.6-tons per acre. It is thus possible to state that the calculable figure is in fact much higher. Meaning (again) that a multiple of “times-three” to a “times-eight”, is possible. But how does that equate a multiple of “times-sixteen”? 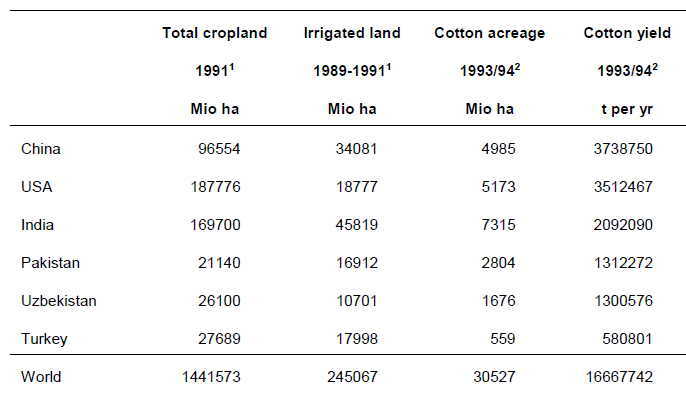 (Total Cotton yield 1993) / (total Cotton Acreage) = 286 pounds per acre. Now if we were to plug in 286lbs and compare that cotton yield to that of an Oklahoma farmers yearly Hemp yield . . . one probably could come up with a multiple of Times-Sixteen. But mathematically speaking, other than through such slight of hand, one views no other way of obtain such a figure. Thus we repeat; a multiple of “times-three” to a “times-eight”, is very realistically possible and maybe more on a good year, but a multiple of “times-sixteen”, that truly is a bit hard to swallow. That this Water is need by other crops, etc. But on the other side, we have yet another water myth being circulated; THIS ONE BEING THAT Hemp “ONLY” requires a mire fraction of what other crops need to grow. -- ALSO simply Not True. --- And grant it, if one monkeys around with the statistics, it is indeed possible to come out with some of these outlandish claims. For example: If one compares cotton being grown in the middle of hot Arizona (mostly desert country), to a hemp crop being grown in the wet English countryside. Yes one can indeed come up with an irrigated water formula of twenty to one in hemp’s favor. But that would be like comparing apples to oranges; ---it simply can’t/shouldn't be done. All living things require water. Hemp requires water to grow, as does every other crop out there. However, being a bit more descriptive, hemp does best under nice moist soil conditions. This does not mean that it won’t grow in more arid areas, only that it does best in moist soil. One to which they will claim was started by the likes of some “Unwashed Hippie” and is very soon to go away. And with it (we are lead to presume) the demand for Industrial Hemp fibers. That there is very little Industrial Hemp growth in the U.S.
That for quite some time now, globally Hemp production has stagnated. And in terms of total acreage, that Hemp production has been in declined for quite some time. That its structure allows for the cloth to breathe, so one doesn’t get sweaty during hot humid days. That we’ve already have a large infrastructure for cotton production. Thus their argument goes; What do we need with Hemp for? And anyway, it’s ONLY A FAD, and one that will soon go away. Thus no need to change the laws and that we should just keep them the way they are. That some of these naysayers are actually paid propagandists whose very job is to keep the present day status-quo fully in place. That after 20 years of hemp advocates trying to end the prohibition; --- that one think that the fad would have long ago given out. That hemp’s illegality NOT economic factors, is what lead to its decline. If it’s against the law, they will argue, then no wonder farmers are not growing it. As a second counter argument to hemp’s decline, it could also be said the illegal Hemp growth has been on the increase, while illegal Cotton growth is near zero; Why is this, it might be asked? That while true Cotton is a natural fiber -- So is Hemp, and that it too can be made soft and flexible. But probably their most vocal argument against the naysayers is that; In an age of food insecurity (too many people, not enough farm land etc. ), do they ready think that a crop that can grow up to eight times as much clothing fiber per acre, is simply a fad? The naysayers would have us believe that Hemp is a NO-GO, because unlike cotton, American farmers do not have adequate Farm machinery specially dedicated for hemp growth. --- An argument so defies logic and reason, one wonders how its proponents are simply not just laughed out altogether. American Farmers in Colorado are already growing Industrial Hemp without any farm equipment problems. Driers do what their name implies to the damp hemp stalk after It has lain in the field to be "dew-retted." Breaks are fluted rollers through which the dried stalk is forced, crumbling the hard fiber outside away from the inside pulp and wood. Scutches brush off the unwanted wood and pulp and scrub up the fiber generally. Thus establishing processing Hemp Mills is actually a non-event. As for the permits to build, what is one to say, “stupid is as stupid does”, meaning the same can also be said of cotton facilities. While these two questions seem (at least on the surface) easy enough to answer, as anyone having done research on the Internet can attest. There’s a lot of “Mambo Jumbo” out there regarding the whole subject. With some proponents of re-legalization claiming NO FERTILIZER is required, while others (not so favorable to re-legalization), sighting its use as yet one more reason NOT to re-legalize. A proper crop rotation system has been established. This is evident by fig-6 (sec 6.7) taken from the 1947 pamphlet “Soil Type and Soil management Factors in Hemp Production” This seems to have something to do with some crops using up only certain nutrients not required by the next seasons crop etc. To quote one article. The farmland in question is allowed to lie fallow for some period of time, a biblical system that allows the soil to somehow refurbishes itself. A process that seems to have something to do with a bunch of worms running around, doing what earth worms do all the time. It may also not be needed if the hemp crop is being grown for seed, and is very thinly spaced. In which case the seed can be planted in a checkerboard like manner, one in which the dark squares are seed one season and the light squares the next, etc. No crop rotation system is in place, meaning hemp is being planting season after planting season. This is because hemp, no matter how environmentally friendly still requires/uses soil nutrients. Or if the soil is extremely poor (lacking in nutrients) to begin with. A statement which while technically true, sounds fantastic, ecologically correct, and probably put up by a well meaning individual, is also kind of misleading. Why? Because, as can be seen from the below table; -- Just about anything out there makes use of a lot less fertilizer than corn does. Meaning that planting a hemp crop leaves the soil a lot healthier and better able to grow the next seasons crop then before the hemp planting. And on paper that is true. Example; Pretend that a patch of soil has no nitrogen, none what so ever. Assuming a hemp crop and that a pound of nitrogen fertilizer was added to the soil, that would mean that after harvest (due to the biomass return). That patch of soil will now have approximately half of a pound of nitrogen in it, whereas before the planing, it didn’t. But be that as it may, it still doesn’t answer the question -- How Much Fertilizer Does Hemp Need? In answer to that question, for which there is quite a babble of (often-contradictory) information on the Internet dealing with that subject. Here we will spare the reader the babble by simply quoting the Oaksterdam University, which by anyone’s standards is a respected organization. 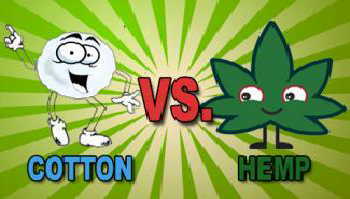 Which makes it sound as if Cotton uses “LESS” fertilizer than hemp does, BUT that’s only if one goes per usage “PER ACRE.” If on the other hand one were to go “PER POUND OF FIBER,” recalling that we can grow three times as much hemp fiber as we can cotton fiber on the same acreage of crop land. Then the true figure comes out to; -- [100lbs (div) 3 = ] 33lbs of nitrogen fertilizer for equivalent fiber growth. Thus, while it is true that it can be said that Hemp requires almost twice as much fertilizer as cotton. It can also be said that Hemp (pound for pound) only requires half as much fertilizer as cotton. However, here the question is not whether or not Cotton and/or Hemp require the use of Lime but in what quantities and what costs? With our conclusion being that this is one of the few times where there is no difference. If the soil is acidic then NO MATTER WHAT CROP is planted you need to balance the pH levels in the soil, meaning any crop (given the same soil conditions) requires the same amount of lime. Which sounds about right for one acre of Lime. Meaning that Cotton while being grown on just 2.4% of ALL (global) farmlands is making use of 24% of all insecticide use. But this is not to say that a Hemp crop is 100% insect free, European farmers are indeed using some amounts of insecticide on their crops, BUT NO WHERE NEAR the amounts required by Cotton production. What can be said about Insecticides is also true about Fungicidal uses. Yes, some funguses do attack the hemp plant, which may thus require the use of pesticides (a pesticide can be either a insecticide or a fungicide). But, needless to say Cotton is way more susceptible to various fungus rots than hemp is by a mile. The fact that cotton, on a global scale, while only accounting for 2.5% of agricultural land use, accounts for 11% of ALL it’s pesticide sales speaks for itself. "As its name “Diseases of Hemp” implies has a good listing of such aliments fugal/bacterial diseases that can afflict hemp plants. But don’t become overly worried, as hemp is a particularly hardy plant and also as these aliments are actually generic in nature and thus affect just about every other plant on the plant. " The naysayers claim that Hemp (just like cotton) DOES INDEED require the use of herbicides, implying that hemp advocates are in error if they state otherwise. However, its been noticed that ALL such naysayers are a bit vague when it comes to actual statistics of actual use. And for good reason; that being that Hemp of-and-by itself IS considered to be an HERBICIDE. Let’s look at the facts. A weed is defined as any unwanted plant. Farmers in general hate weeds, as weeds that take root in their planted acres not only take up space and get in the way of harvesting crops, they also use up soil nutrients, moisture, etc., which are required by the actual crop under cultivation. Yet worst of all, in many cases these fast growing weeds actually cut off the sunlight to the crops being cultivated. Thus no wonder farmers hate those things. So how does Hemp act like an herbicide? Referencing the growth table (sec 6.3), it becomes obvious that Hemp itself is a tall, fast growing crop, meaning it quickly turns the tables on weeds by depriving them of sunlight. Which in turn leads to studded weed growth, so they don’t create as much seed and they die more quickly. Meaning farmers see fewer weeds during the next plowing season, and even fewer the next, etc. Crop rotation policies are in place by the farmer. If it’s hemp one season, and cotton the next, the weeds will spring back up. Partial year crop growth takes place. First time a hemp crop is being planted. Strong winds blow in seeds from adjacent fields. However, the issue here is not whether or not herbicides are in order, but rather the comparable amounts of use by Hemp as oppose to Cotton which (relatively speaking) is a rather short, closed to the grown, slow growing crop. And while there is limited data on exact amounts, it is obvious that Hemp growth requires no where near the amount of herbicide that a similar Cotton crop requires.